We used this catalog in all the wholesale gift shows we did . It cost a whole lot to do a color catalog, so we decided to do this hand drawn black and white one!!! We eventually stopped giving out catalog, as we weren't getting enough orders from them. 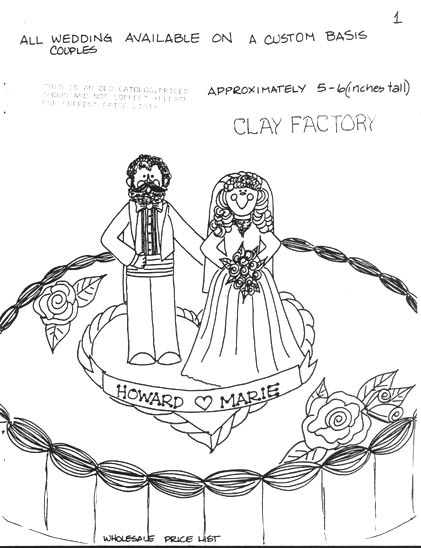 We found that most of the people taking this catalog were Crafters that would copy the designs. Then, of course sell them at the shows they did. A lot of the store buyers complained about us not have this catalog anymore. We explained the why of our decision. We then suggested that they write down the items they liked on the order form we provided to them, along with the prices. Or to place their order with us now. webmaster Last updated 3-1-99 All rights reserved by Clay Factory © , 1997.